My preference is to use a 15 gallon Sterlite rectangular bin (about 4 bucks at WalMart), and I have it up on a table next to the changing table. 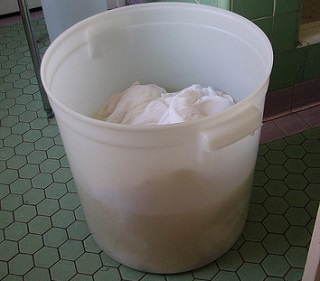 I wash it out quickly with either vinegar or antibacterial hand soap each time I do diaper laundry. It's not smelly, and since it's shallow, it's easy to wash out. No deo disks (which I think smell worse than the diapers). In dry winter weather when we heat with wood, I don't even put a lid on it. The diapers dry out and when they dry out they are surprisingly not smelly. But since I have a 2 story house, I have another setup upstairs. I use diaper pail made for disposables and a diaper pail liner. I like that system upstairs because the Sterlite bin is not as easy to haul up and down stairs as a liner full of diapers. But since it's tall and a pain to wash out, a liner is a must for that one, but liners are kind of pricey. I actually have two liners so I can put the fresh one in right away, so I have a place to put the upstairs diapers used while the liner is in the wash with the diapers. The bin method is less expensive than a pail and liner or two, but both work just fine.